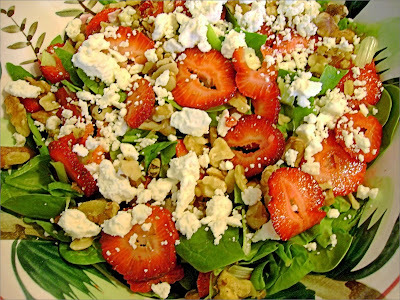 Possibly the perfect salad, this blend of strawberries, spinach, feta, and walnut is deliciousness served pretty. This is a terrific recipe for those casual get-togethers with your mom or bff, especially when you need something quick and easy. To get the most flavor out of this recipe, use fresh ingredients and serve immediately. Toss spinach with sliced strawberries, walnuts, green onions. Toss with your favorite light balsamic vinaigrette . Sprinkle feta cheese over the top of salad.